For the English footballer, see Garth Hudson (footballer). 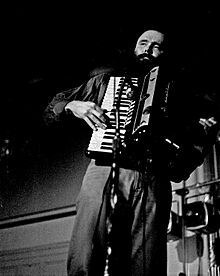 Eric Garth Hudson (born August 2, 1937) is a Canadian multi-instrumentalist. As the organist, keyboardist and saxophonist for Canadian-American rock group the Band, he was a principal architect of the group's unique sound. Hudson has been called "the most brilliant organist in the rock world" by Keyboard magazine. As of 2019, Hudson and fellow musician Robbie Robertson are the last original members of The Band who are still alive. A master of the Lowrey organ, Hudson's orchestral tone sense and style anticipated many of the sonic advances of the polyphonic synthesizer. His other primary instruments are piano, electronic keyboards, saxophone (alto, tenor, soprano, baritone, bass), and accordion. He has been a much-in-demand and respected session musician, performing with dozens of artists and earning the accolades of many, including Elton John, who has cited him as an early influence. Hudson was born in Windsor, Ontario, Canada. His parents, Fred James Hudson and Olive Louella Pentland, were musicians. His mother played piano and accordion and sang. His father, a farm inspector who had fought as a fighter pilot in World War I, played drums, C melody saxophone, clarinet, flute and piano. Hudson moved with his family to London, Ontario, around 1940. Classically trained in piano, music theory, harmony and counterpoint, Hudson wrote his first song at the age of eleven and first played professionally with dance bands in 1949 at the age of twelve. He attended Broughdale Public School and Medway High School before studying music (primarily Bach's chorales and The Well-Tempered Clavier) at the University of Western Ontario. During this period, he grew increasingly frustrated with the rigidity of the classical repertoire, leading him to drop out after a year. In 1958, he joined the Capers, a rock and roll band. He was reported to have said that he also gained some performance experience from playing at his uncle's funeral parlor. In December 1961, the 24-year-old Hudson joined the Hawks, the backing band for Ronnie Hawkins, which already consisted of 21-year-old Levon Helm on drums, 18-year-old Robbie Robertson on guitar, 18-year-old Rick Danko on bass and 18-year-old Richard Manuel on piano. Fearing that his parents would think he was squandering his years of music education by playing in a rock and roll band, Hudson joined the band on the condition he be given the title "music consultant" and that his bandmates each pay him $10 a week for music lessons. Revealing a bit of the thinking behind his early fears, in The Last Waltz Hudson told interviewer-director Martin Scorsese: "There is a view that jazz is 'evil' because it comes from evil people, but actually the greatest priests on 52nd Street and on the streets of New York City were the musicians. They were doing the greatest healing work. They knew how to punch through music that would cure and make people feel good." Hudson was one the few organ players in rock and roll and rhythm and blues to eschew the Hammond organ. Upon joining the Hawks, Hudson took the opportunity to negotiate the procurement of a new Lowrey organ as part of his compensation. The Lowrey organ offered a different mix of features, and Hudson stayed with Lowrey right through Ronnie Hawkins and the Hawks, Bob Dylan and the Band, playing three different models: originally a Festival (FL) console, which was replaced by a Lincolnwood TSO-25 during 1969, and later still a horseshoe console H25 model, as depicted in The Last Waltz. Under the strict supervision of Hawkins, the Hawks became an accomplished band. They split from Hawkins in 1963, recorded two singles and toured almost continually, playing in bars and clubs, usually billed as Levon and the Hawks. Hudson started work as a session musician in 1965, playing on John Hammond, Jr.'s So Many Roads along with Robertson (guitar) and Helm (drums). Hudson performing with the Band, Hamburg, Germany, May 1971. In August 1965, they were introduced to Bob Dylan by manager Albert Grossman's assistant, Mary Martin. In October, Dylan and the Hawks recorded the single "Can You Please Crawl Out Your Window? ", and in January 1966 they recorded material with Dylan for what would turn into the Blonde on Blonde album. Dylan recruited the band to accompany him on his controversial 1966 "electric" tour of the United States, Australia and Europe. (An album of Dylan's 1966 performance with his band, The "Royal Albert Hall" Concert, was finally released in 1998.) Subsequent to Bob Dylan's motorcycle accident in July 1966, the group settled in a pink house in West Saugerties, New York, near Woodstock. Dylan was a frequent visitor, and Hudson's recordings of their collaborations resulted in The Basement Tapes. By 1968, the group recorded its debut album, Music from Big Pink. The album was recorded in Los Angeles (at Capitol) and New York (at A&R Studio). Capitol originally announced that the group would be called the Crackers, but when Music From Big Pink was released they were officially named the Band. The album includes Hudson's organ showcase, "Chest Fever", a song that in the Band's live shows would be vastly expanded by a solo organ introduction, entitled "The Genetic Method", an improvisational work that would be played differently at each performance. An example can be heard on the live album Rock of Ages. Hudson is also adept at the accordion, which he played on some of the group's recordings, such as "Rockin Chair", from The Band; the traditional "Ain't No More Cane", from The Basement Tapes; Dylan's "When I Paint My Masterpiece"; and Bobby Charles's "Down South in New Orleans" during The Last Waltz. His saxophone solo work can be heard on such songs as "Tears of Rage" (from Big Pink) and "Unfaithful Servant" (from The Band). Hudson is credited with playing all of the brass and woodwinds on the studio version of "Ophelia" from the 1975 album Northern Lights - Southern Cross. This album, the first to be recorded in the Band's Shangri-La recording studio in Malibu, California, also saw Hudson adding synthesizers to his arsenal of instruments. Hudson provided innovative accompaniment. For example, the song "Up on Cripple Creek" features Hudson playing a clavinet through a wah-wah pedal to create a swampy sound reminiscent of a Jew's harp or the croak of a frog. This clavinet–wah wah pedal configuration was later adopted by many funk musicians. 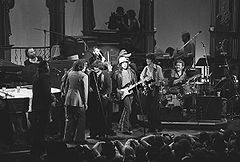 The initial iteration of the Band made its final bow as a touring band with a lavish final concert on Thanksgiving Day 1976 at the Winterland Ballroom in San Francisco, an all-star tribute concert documented in The Last Waltz. The Band released one more album after the Last Waltz, Islands, and then dissolved. By then, Hudson had married his singer/actress wife, Maud. He had his own property, Big Oak Basin Dude Ranch, in Malibu, which was destroyed by wildfires in 1978, after extensive renovations that included an impressive studio. He was active during this period as a session musician, performing on movie soundtracks and albums by many other artists, including Emmylou Harris, Van Morrison (Wavelength) and Leonard Cohen (Recent Songs). He composed music for Our Lady Queen of the Angels, a multimedia show created for the Los Angeles bicentennial in 1980. In the early 1980s he accompanied the Call on one of their albums and appeared with them in a music video which was played on MTV. The Band reformed in 1983, with all the original members except Robbie Robertson. Richard Manuel, who had lived at Hudson's ranch in 1978, committed suicide in 1986. Supplemented by a rotating roster of additional musicians, the Band continued to tour. It released three albums in the 1990s. In 1988, Hudson recorded Feed the Birds on Stay Awake: Various Interpretations of Music from Vintage Disney Films, produced by Hal Willner. In 1990 Hudson, playing accordion and soprano saxophone, along with bandmates Levon Helm and Rick Danko, who harmonized with the vocalists, took part in Roger Waters's massive performance of The Wall at the Berlin Wall. As a member of the Band, Hudson was inducted into the Juno Hall of Fame in 1989 and the Rock and Roll Hall of Fame in 1994. He has played on various solo efforts of his bandmates Rick Danko, Levon Helm, and Robbie Robertson. Hudson released his first solo album, The Sea to the North, on September 11, 2001. In 2002, with his home in foreclosure and Robertson having bought out his stake in the Band, Hudson was forced to declare bankruptcy for the third time. He continued to record and perform. On July 13, 2002, he was honored with the Canada South Blues Society's Lifetime Achievement Award. In 2002, he joined with former Flying Burrito Brothers' pedal steel player Sneaky Pete Kleinow to form Burrito Deluxe, with Carlton Moody of the Moody Brothers on lead vocals and guitars, bassist Jeff "Stick" Davis of the Amazing Rhythm Aces and drummer Rick Lonow. The group recorded two albums, Georgia Peach and The Whole Enchilada, before Kleinow departed in 2004 because of health problems. In 2005, Hudson formed his own 12-piece band, the Best!, with his wife, Maud, on vocals. That same year, Garth and Maud Hudson released Live at the Wolf, a piano and vocal album recorded live at the Wolf Performance Hall in London, Ontario. On November 20, 2005, Hudson received the Hamilton Music Award for Best Instrumentalist. He continues as a much-in-demand session player, performing with such artists as Neko Case (Fox Confessor Brings the Flood and Middle Cyclone), Chris Castle (Last Bird Home), Teddy Thompson (Separate Ways), the Secret Machines (Ten Silver Drops), the Sadies (Live 2006), the Lemonheads, Jonah Smith (2006 self-titled debut), Yesterday's News (The Northside Hotel), Billy the Kid (The Lost Cause) and others. He contributed an original electronic score to an off-Broadway production of Dragon Slayers, written by Stanley Keyes and directed by Brad Mays in 1986 at the Union Square Theatre in New York. The production was restaged with a new cast in Los Angeles in 1990. A few of the artists Hudson performed with in 2006 are Ronnie Hawkins, the Sadies, Neko Case, Heavy Trash, John Hiatt, the North Mississippi All-Stars, Blackie and the Rodeo Kings, and Chris Zaloom, some of which were recorded. Hudson and his talent on piano are prominently featured in the 2007 Daniel Lanois DVD documentary Here Is What Is. On November 16, 2010, Hudson released Garth Hudson Presents: A Canadian Celebration of the Band. The album features Canadian artists covering songs that were recorded by the Band. Hudson plays on every track and co-produced the album with Peter J. Moore. Acts that appear on the album include Neil Young, Bruce Cockburn, Blue Rodeo, Cowboy Junkies, the Trews, Great Big Sea, Hawksley Workman, Mary Margaret O'Hara, Chantal Kreviazuk, Raine Maida and Ian Thornley. ^ "Music: Down to Old Dixie and Back". TIME. January 12, 1970. Retrieved 2014-05-23. ^ "Keyboard Magazine: Garth Hudson". Theband.hiof.no. December 1983. Retrieved 2014-05-23. ^ Andy Greene (February 2, 2011). "Elton John Gives Billy Joel 'Tough Love' in New Rolling Stone Cover Story | Music News". Rolling Stone. Retrieved 2014-05-23. ^ Johnson, Brian D. (July 22, 2002). "Garth Hudson (Profile)". Maclean's. ^ Heylin, 1996, Bob Dylan: A Life In Stolen Moments, pp. 83–84. ^ Heylin, 1996, Bob Dylan: A Life In Stolen Moments, pp. 86–89. ^ "Who Plays What Instruments "The Band"". Geocities.jp. Retrieved 2014-05-23. ^ Selvin, Joel (January 8, 2011). "The day the music lived / Rereleased 'Last Waltz' documents amazing night in 1976 when rock's royalty bid farewell to the Band – Page 2 of 2". The San Francisco Chronicle. ^ "Jason Schneider: The World According to Garth". Theband.hiof.no. Retrieved 2014-05-23.